ONCE AGAIN, ENJOY THE HAMBURGER – an ALL-AMERICAN staple you CAN have on the Carb Light Living™ Program. Pictured here is the cheeseburger that we enjoy many times each week! Place your roll and bread order by visiting LowCarb-R-Us.com and get a 10% savings on your entire order! Get the pizzas too! Click here to find out about the fabulous personal pan pizzas from LowCarb-R-Us.com. 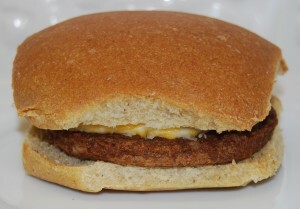 Go to: LowCarb-R-Us.com to order the O carb hamburger roll and save 10% on your FIRST time order with LowCarb-R-Us.com! Simply add “CLL” (a Carb Light Living™ exclusive offer) in the coupon code box at check out. Stock up – try all the delicious bread products from the Health Wise and Health Express lines via LowCarb-R-Us.com and save 10%. Select the roll, and any additional items sold by LowCarb-R-Us.com – you get 10% off everything! NOTE: Choose Ground Mail. It’s much cheaper. If you purchase 1 pack of rolls, the rate is $11.66 and if you choose 6 of the same product, they price is only $15.07. Here’s a picture of Mr. and Mrs. 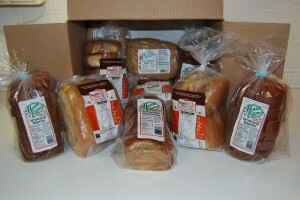 Shrinking Man’s bread order which arrived yesterday, March 16th!